Exfoliation is a habit of beauty that should not be missing in any routine for skin care. While exfoliation should be done occasionally, it is very important to keep in mind because, thanks to this, we facilitate the removal of dead skin cells and other impurities that can affect the beauty. In the market there are many types of exfoliating products that can help care for the skin and deep clean to keep it healthy. However, nature provides some highly beneficial ingredients for the skin, which can be used in exfoliating masks to clean naturally, leaving it smooth, free of excess oil and all kinds of impurities that can cause disorders such as acne. If you want to choose to use natural products to care for your skin, do not miss the following eight exfoliating masks with ingredients that you probably have at home. The avocado is a very good for the skin thanks to its content of healthy fats and vitamin E. Combined with fruit yogurt, makes a natural exfoliating able to remove impurities from the skin, leaving it soft and moisturized. Crushed ripe avocado pulp, add the yogurt and form a paste. Apply a mask for 15 minutes, and finally remove it with a damp cloth. Repeat this treatment once a week. Oats and almonds are two good ingredients to exfoliate skin naturally and help remove dead cells. This mask is really special because, in addition to exfoliate, also provides moisturizing properties and acts as a tonic . 2 teaspoons almonds (12 g). 2 drops of essential oil of roses. Mix all ingredients in a blender and apply the exfoliating cream all over his face. Let stand for 15 minutes and then remove it with a soft cloth. A hydrating fruit like papaya is marvelous masks to exfoliate the skin. 1 teaspoon honey (7.5 g). 1 tablespoon comfrey welded (Symphytum officinale) powder. Mix all ingredients in a bowl to form a paste and then apply it all over your face, leaving it on for 10 to 15 minutes. 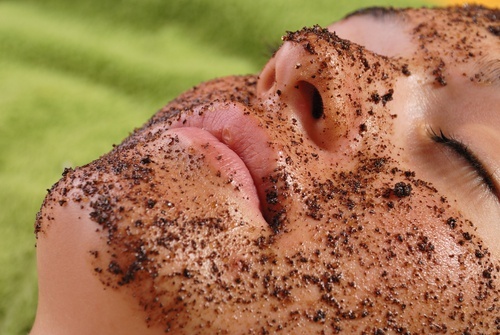 Coffee is one of the best homemade exfoliating we can use. It’s great for the skin and helps eliminate impurities for clean, fresh face. Mix both ingredients in a bowl and then apply it to the face with gentle circular movements. Leave it on for 10 minutes and rinse. This mask exfoliant home is ideal for removing dead cells and impurities from areas such as elbows and knees. 1 cup honey (335 g). ½ cup warm water (125 ml). Mix all ingredients and set aside in refrigerator for three hours. After the recommended time, use it to clean your elbows and knees with gentle massage. This mask is ideal to exfoliate the skin and whiten naturally. It is important to apply it at night, as if exposed to the sun can cause skin blemishes. 2 tablespoons sugar (30 g). Mix the two ingredients and apply the mask with gentle circular movements. Let stand 15 minutes and remove it with warm water. This natural exfoliate is ideal to close the open pores , remove excess fat in the skin and a smoother, softer texture. Serum 3 tablespoons (45 ml). 1 tablespoon salt (10 g). Mix both ingredients into a paste and then apply this exfoliating mask with gentle circular movements. This oatmeal and honey scrub is ideal for removing dead skin cells and give it a fresh look. 2 tablespoons oats (20 g). Mix both ingredients well and apply the mask covering your entire face, previously wet. Let stand 20 minutes and then remove it with warm water and gentle circular massage.